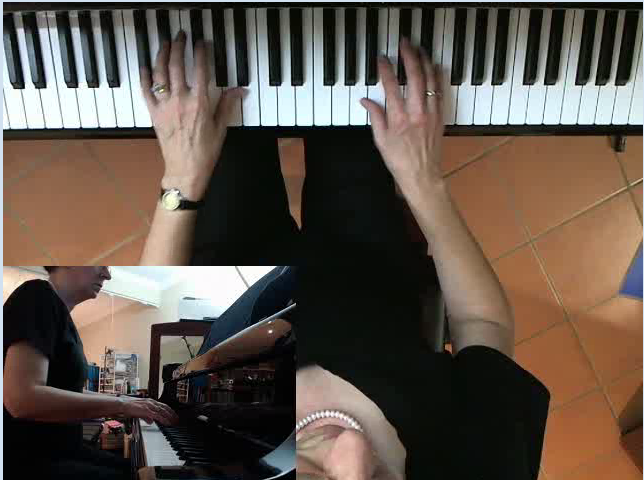 Online lessons via a video chat provider such as Zoom, Skype or Google Hangout provide a successful alternative to piano lessons in person. Thus far I have found Zoom to be the most satisfactory of these providers for lesson purposes. Here are suggestions for piano and pedagogy lessons. Click here for information on taking theory and musicianship lessons online. 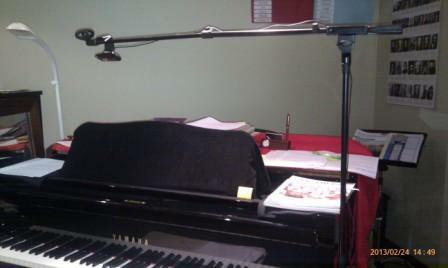 I use a microphone boom stand to suspend a webcam above the keyboard. The top down view is very helpful. See Maximising Your Lessons (this page is still under construction) for ideas on how best to prepare for an online lesson. Occasionally there are problems with a video chat provider, so it is helpful to have accounts with several providers (Zoom, Skype, Google), so that if one is not working, we can quickly change to the alternative. I am continuing to explore video chat alternatives and will post information here. Click on this link for information on setting up for Theory or Musicianship lessons online.